Love & Hummus: Support us with edible credits. 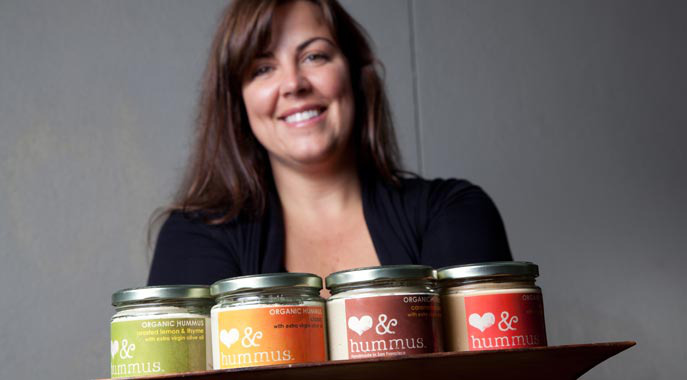 The Love & Hummus Co. is passionate about creating sustainable Mediterranean food and certified organic hummus that is lovingly handmade in small batches and scooped into BPA-free, Earth-friendly packaging for superior taste and quality. All of our hummus is vegan, non-GMO, wheat free and contains absolutely NO citric acid, fillers, additives or preservatives. We are committed to putting our customers first, creating a smaller carbon footprint and giving back to our community. We strive to fill your belly with delicious hummus and organic food made with a conscience. Who knew a little jar could do all that? The women in my family shower the people we love with delicious handcrafted food. Delicious handmade dinners, family gatherings, and big tables filled with Mediterranean delights are some of my earliest memories. As a busy new working mother, I no longer had time to make my favorite homemade recipes from scratch, so I began searching for store bought versions of my favorite foods, like hummus, that met my high standards for homemade flavor. When my search left me empty handed, or shall we say with an empty pita, inspiration struck, and The Love & Hummus Co. was born. Your pre-purchase of Love & Hummus Credibles will help us launch exciting new products and buy new equipment to keep up with growing demand of our organic hummus and Mediterranean food products. Did you know you can support us while you do your other shopping? Simply prepay us here and download the app to your smartphone. Then use Credibles coupons from your app at checkout. Learn more more at credibles.org/checkout. Trying out Love & Hummus for the first time? Here's a low entry level for you to get started. Free Love & Hummus T-shirt. Free t-shirt and complimentary invitation to our annual tasting party. T-Shirt, complimentary invitation to our annual tasting party, and a Love & Hummus gift box mailed anywhere in the US. At the register, use the Credibles app on your smartphone to redeem your credits for Love & Hummus.